Learn some of the pros and cons of each fuel source, and find out about newer, more efficient types of water heaters that could save you money down the line. If you’ve had the same hot water heater for longer than 10 years—the standard lifespan—it’s smart to consider replacing the appliance before it quits performing and puts you in a tough position. Before you start shopping for a new water heater, however, you need to know which power source it will use: gas or electric. While both types are quite similar, there are some differences between the two in terms of options and efficiencies. The following guide will discuss current water heater technology and break down some key considerations so you can choose the type of water heater best suited to your needs. The decision of gas versus electric water usually boils down to the type of power already in the home. “In most cases, you are going to just go with whatever your home has been fitted with already,” says Daniel O’Brian, technical expert for online plumbing and HVAC retailer SupplyHouse.com. Nearly all houses have electricity, and many have access to both gas and electricity. If you have only electricity, however, the choice is simple: You’ll need to choose an electric water heater, such as AO Smith’s 50-Gallon Proline Residential Electric Water Heater (available from SupplyHouse). For rural dwellers, who generally don’t have access to natural gas, an electric hot water heater may not be their only choice. If they have propane, they can opt for a gas water heater, such as the Rinnai 160,000 BTU Condensing Tankless Water Heater, and then purchase a Rinnai NG to LP Conversion Kit (both available from SupplyHouse) to convert the unit to propane use. Both gas and electric water heaters are rated by “input,” a measurement of the amount of gas or electricity that’s used per hour to heat the water in the tank. Gas input is measured in BTUs, and electrical input is measured in watts. 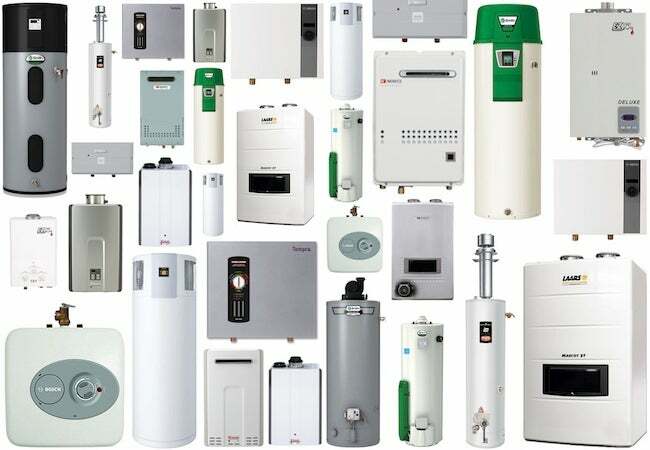 • Average input ratings for a gas water heater range from around 30,000 to 180,000 BTUs, depending on size. The more BTUs, the faster the unit will heat water. • Electric water heaters range in power input from about 1,440 to 5,500 watts, and the same principle applies—the higher the wattage, the more quickly the unit will heat water. Gas water heaters tend to have higher initial costs than comparable electric water heaters but can also cost less to operate. The cost of a water heater varies “depending mainly on how big, efficient, and high quality your water heater is,” O’Brian says. “Typically, the higher the cost, the better the unit will run.” You will, however, spend more up front for a gas hot water heater, such as the AO Smith 50-Gallon Proline Gas Water Heater, than you’ll spend for a similar-size electric hot water heater, such as the AO Smith 50-Gallon Proline Electric Water Heater (both available from SupplyHouse). While a water heater’s price tag is important, it shouldn’t be your only deciding factor. Cost of operation, efficiency, and performance should also play a role in your decision. Electric water heaters (particularly electric heat pump water heaters) can have higher EF ratings than gas water heaters. A gas or electric water heater’s energy factor (EF) is a measurement that compares the amount of hot water the heater produces per day to the amount of fuel it consumes. The higher the EF number, the more efficient the water heater. While the efficiency of gas and electric models tends to be fairly similar, especially when you’re looking at models of the same manufacturer and size, certain types of electric-powered models—including heat pump and hybrid heat pump units, described below—have the efficiency advantage. If you’re shopping online, you won’t be able to view the Energy Guide label, but reputable retailers like SupplyHouse.com offer all the technical details about the models they sell, so you’ll still have the information you need to make an informed choice. Certain types of gas and electric water heaters are inherently more efficient. Neither fuel type promises the best efficiency; rather, manufacturers have developed highly efficient subcategories of water heaters for each type of power source. • Condensing water heaters are more expensive than similar non-condensing units. • Operating costs are lower for condensing water heaters. • Condensing water heaters have higher first-hour ratings and recovery rates than non-condensing models. • An installed gas line is required. The pinnacle of efficiency in electric water heaters is the heat pump unit. This water heater operates by drawing heat from the air, making it best suited for use in warm climates. Heat pump units, such as the Stiebel Eltron 58-Gallon Accelera 220 Water Heater (available from SupplyHouse), are pricier than non-heat-pump models (they can run $800 to $2,500 more than a standard electric model), but they are the most efficient water heaters on the market today. 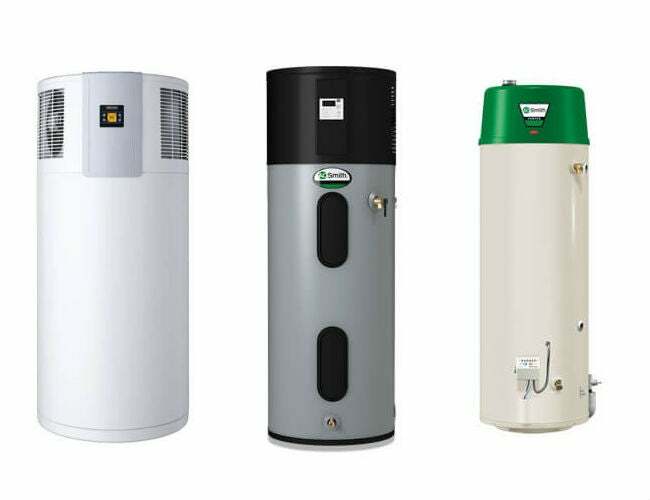 Hybrid heat pump water heaters, such as the AO Smith 50-Gallon Voltex Hybrid Heat Pump Water Heater (available from SupplyHouse), allow the consumer to choose different operating modes for different situations to increase the appliance’s efficiency. For example, most hybrid heat pump units have a “vacation” mode that reduces operating costs when no one is at home. Depending on the model, you could save up to 80 percent on hot water costs by choosing a hybrid heat pump over a standard water heater. These appliances must be installed in an area of at least 1,000 square feet, though, so while they’re a good option for a roomy garage, they’re not appropriate for a small utility closet. Tankless units, also known as “on-demand” or “point-of-use (POU)” water heaters, come in both gas- and electric-powered options. These slimmer setups operate by drawing water in through a heating element when either a faucet or an appliance is turned on. Because they heat water as you use it, they can be up to 35 percent more energy efficient than a traditional tank-type water heater. Gas-powered tankless water heaters can be condensing or non-condensing, such as Rinnai’s 180,000 BTU Non-Condensing Water Heater (available from SupplyHouse). “They are limited on how much hot water can be pumped out at once, so size the appliance according to how much hot water you’ll need,” O’Brian advises, adding, “but you will never run out.” Note that, because they don’t store hot water, recovery and first-hour ratings (see below) don’t apply. Instead, tankless water heaters are rated for size by their “flow rate,” measured in gallons per minute (GPM). A tankless water heater’s flow rate determines how much water the unit can provide at one time. You can read more about selecting the right size for a tankless water heater on SupplyHouse.com. Gas water heaters tend to heat up more quickly. • Recovery rates, listed in gallons per hour (GPH), indicate the amount of water that the unit can heat an additional 90 degrees Fahrenheit over a period of time. For example, the AO Smith 50-Gallon Power Vent Water Heater (available from SupplyHouse) lists a recovery rate of 55.9 GPH; this means that in one hour it will heat nearly 60 gallons of water by 90 degrees. 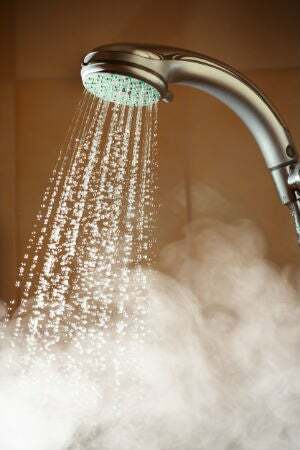 • FHR signifies how much hot water the heater can deliver in the first hour when the water in the tank is fully heated. The more efficient the water heater, the higher the FHR. For example, the Bradford White 40-Gallon Energy Saver Water Heater (available from SupplyHouse) has a first-hour delivery rating of 56 gallons, which means that after the water in the tank is fully heated it can produce 56 gallons of hot water in the first hour after you begin using it. Because they hold more hot water, larger tanks offer higher FHR ratings, but the unit’s efficiency is also a factor in determining the rating. An electric water heater installation could be a DIY project. An enthusiastic do-it-yourselfer with basic electrical knowledge can usually replace an electric water heater and save on installation costs (typically an extra $350 to $450, depending on where you live—different areas of the country will bring different costs). Replacing a gas water heater, which requires disconnecting and reconnecting a gas line, is another story entirely. Installation requires maneuvering gas lines, and natural gas and propane water heaters (unless they’re condensing models) must also be vented to the outdoors. “This just isn’t a job a typical homeowner is equipped to handle—I would recommend calling a pro for the installation,” O’Brian says. If a homeowner already has a gas water heater, he or she can expect to pay $400 to $550 for a plumber to remove the old unit and install the new one, no matter whether it’s a tank or tankless model. Switching to gas from electric, though, can tack on an additional $1,500 to $2,300 in installation costs for running a new gas line and installing venting. The style of water heater (for example, tank or tankless), as opposed to the power source, will determine how long it lasts. For both gas and electric, tank water heaters last an average of 10 to 13 years, and tankless units last up to 20 years or longer. The average for electric heat pump water heaters is 12 to 15 years. 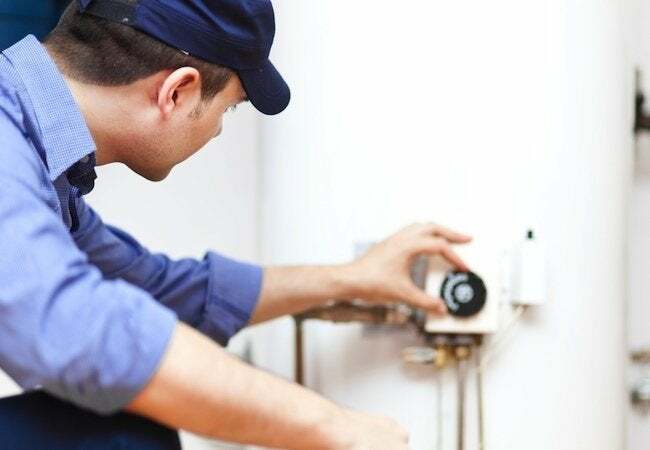 Whatever style of water heater you purchase and no matter whether you opt for gas or electric, you’ll get the longest useful life out of your water heater if you always follow the manufacturer’s annual service and maintenance schedule.